Recently I showed this cute, updated cabin to some buyers who ultimately chose a cabin on a different lake that they had vacationed at for several years. 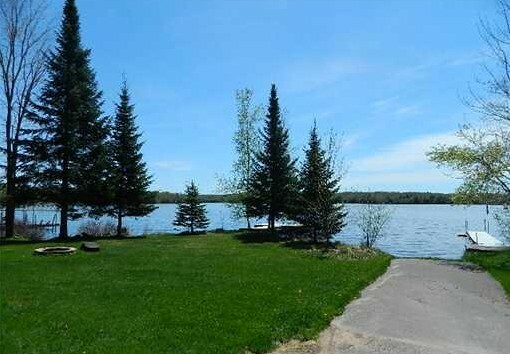 Located on scenic Moose Lake, this condo cabin is only about a 26 mile drive east from Hayward, right in the Chequamegon National Forest area. One of my favorite destinations around Hayward, the Chequamegon National Forest displays a backdrop of pristine, panoramic views of these wooded lands. If you haven’t been out this way before, you will be awed by the natural beauty of this area. This is the outdoor enthusiasts’ paradise; snowmobile, ATV, cross-country, skiing, and mountain bike trails all nearby. According to the Sportman’s NW WI Fishing Guide, Moose Lake is 1,670 acres of dark brown water, a fairly shallow lake with a maximum depth of 30 feet, a mean depth of 15 feet. The tree-lined terrain along its shoreline is absolutely stunning! Every fall, the dam is opened and the lake drained down some 5 feet, which allows most of the pier owners to leave their piers in place over winter. This cabin has southern exposure on a spectacular point near the southern-center of this lake, and is part of the Moose Lake Condominiums. 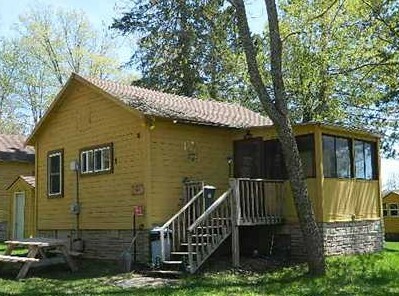 This 4-season cottage allows you to partake in all the different seasons’ activities here in northwest Wisconsin. Several recent improvements include a new well, septic, foundation, windows and bathroom remodel. This affordable condo comes with the private dock, a garage stall for storage and most of the furnishings-its ready for you to move in and enjoy! 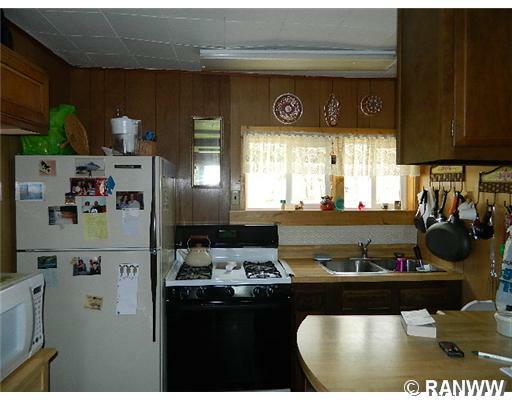 Inside I found a nicely appointed kitchen with everything one needs. The bathroom has been attractively remodeled with a north woods theme. 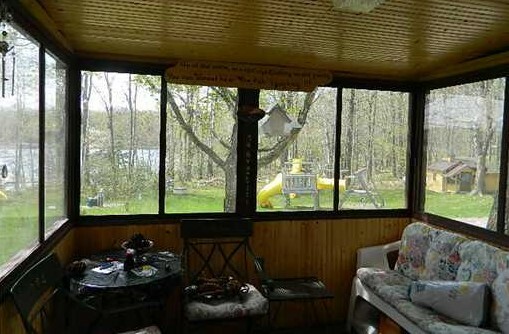 Relax on your screened porch and savor the serene lake view. 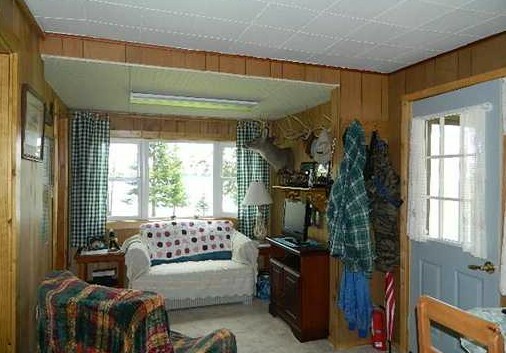 Two bedrooms and a comfortable living area round out this lakeside cabin. This could be your perfect vacation home for your year round activities in this appealing Moose Lake area. If you’d like more information about this cabin, don’t hesitate to contact me! This entry was posted in Cabins For Sale Hayward, Condos For Sale Hayward, FEATURED PROPERTIES, waterfront cabins, waterfront condos and tagged area north realty, cabin condo for sale wi, cabin for sale hayward, cabin for sale wi, cathy lareau, chequamegon national forest, Chequamegon-Nicolet National Forest, Condominium, fishing moose lake, Hayward, lakefront cottage for sale hayward, lakehome for sale hayward, moose lake hayward. Bookmark the permalink.